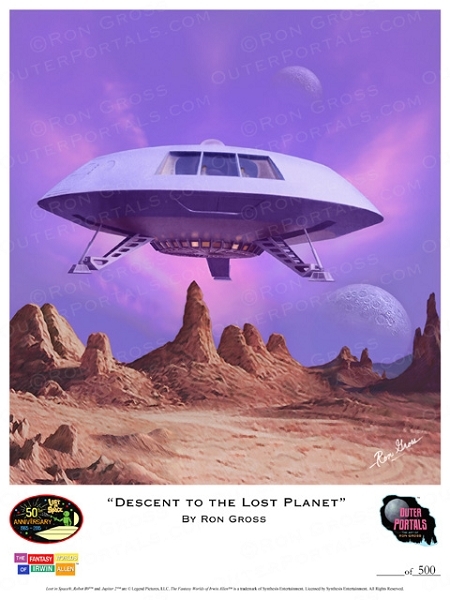 "Decent to the Lost Planet" is another signed print by Ron Gross. This illustration was used on the first edition of Moebius Models' Jupiter 2 model kit. This is an officially licensed Lost in Space commemorative poster. Ron Gross is known for his artwork on the Polar Lights and Moebius Models Jupiter 2 kits, as well as the Moebius Models Seaview and Flying Sub. This measures 12 x 16 inches and is sign and numbered.